The first time I tried the stuff was a few weeks before we landed in Turkey. We were going to a Persian restaurant in Florida with some friends and the waiter suggested we try some of the Iranian doogh, flavored with mint, on the house. The cup that was poured for three of us try ultimately made it around the table of 12 with no one willing to try more than a sip. Then we got to Turkey, managed to couchsurf in Istanbul, and it was served again and again and again. Down the hatch it went each time. I grew to like the stuff, Jillian, not so much. The Turkish version, ayran, is the word you might have heard of before. All over Turkey it was served to us with meaty dishes. On its own, I still think the stuff is aweful, but with a nice plate of spicy kebab it is a perfect match. It is served on menus basically anywhere the Ottoman Empire went and according to some sources, McDonald’s even includes it on its standard menu in the region. The beverage is a simple mix of yogurt, water, and usually a bit of salt. Then it might be flavored with a variety of other things such as minced cucumber, chopped mint leaves or even garlic. Often it is served out of a pitcher but it is so popular that it comes bottled in the store alongside cans of coca-cola. Sometimes it is even foamy to help you with your stylish milk mustache. We drank it for the last time for sometime to come (the next likely chance will be the Indian version called lassi) while in Yerevan as we ate more traditional food than we could shake a stick at. Our Couchsurfing hosts made sure we had a chance to try everything imaginable and this included the local style of aryan, called tahn, with cucumber mixed inside. The flavors in the meat dishes that went along with the drink were strong and spicy and my aryan went down without a problem…Jillian however, opted for the juice. 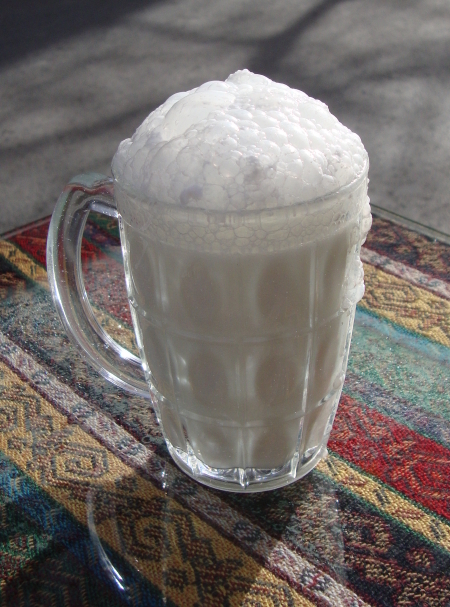 If you try it, take a bite of your meat first, then start to drink the ayran…it is a bit of an acquired taste. Yeah…don’t know if the true Turkish version was any better than the “Florida” one..but that was some nasty stuff!! !